Let me know if they do anything crazy. Message 61037 - Posted: 10 Feb 2014, 21:37:25 UTC - in response to Message 61033. I do not think that anybody can get any of them. When I try to update MilkyWay@home in BOINC, I get a feeder not running error. Yep working on that unrelated to the new units. It should be back up now. Message 61041 - Posted: 10 Feb 2014, 23:39:13 UTC - in response to Message 61033. The tasks with bpl failed immediately here, the others work fine. Been having this problem for months now. Looks like they brought your system down. Gotta love my humor! The error you are getting say it can not load the function. Your binary says it is an anonymous binary which means it was self compiled or compiled outside of our releases. The modified fit program had two iterations in its release. The bpl part is the second iteration. I would suggest running the binary with the --version option from the command line and comparing it to the source code version. From what I am seeing in the responses between your machine and the server and the error codes it looks like you need to compile the latest version of the code. Message 61062 - Posted: 11 Feb 2014, 16:42:27 UTC - in response to Message 61056. Okay, okay...It's not my intention to hijack this thread, but could you or another admin respond to the server issues brought up in the SERVER DOWN or Server Error: Feeder not running threads? 2/11/2014 11:45:43 AM | Milkyway@Home | Sending scheduler request: To fetch work. I've been receiving these messages for over 24 hours now. Anybody got a screw driver and a wrench? If not, how about a rubber mallet? Message 61065 - Posted: 11 Feb 2014, 17:37:34 UTC - in response to Message 61064. I am of course having the same problem, with the lack of MW units, but my other projects are getting units just fine. Check the Event Log to see what the other projects are saying in there, they could be out of units too or your settings need adjusting in some way. 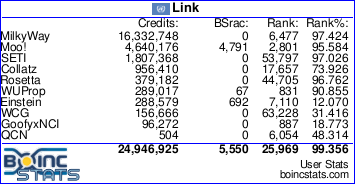 Boinc is complicated and although it is supposed to handle this kind of situation seamlessly it does not always do that. The services have been restarted. I will subscribe to the other thread so I can see updates to that. Looking like WUs are scarce? Team AnandTech - SETI@H, Muon1 DPAD, F@H, MW@H, A@H, LHC@H, POGS, R@H, Einstein@H, DHEP. Sorry to post here, but I can't seem to post anywhere else. All of my jobs seem to have stopped and I can't start them. Any ideas on how I can get them going again? Message 61425 - Posted: 18 Mar 2014, 22:46:53 UTC - in response to Message 61424. Which system are we talking about? I suggest asking this question again in the number crunching section. Message 61427 - Posted: 19 Mar 2014, 18:01:52 UTC - in response to Message 61424. Isn't just 769 WUs ready to be sent a rather low figure? Mind you I've only noticed the figure since my client was struggling to get WUs the other day. If you can post here you can post anywhere, if you came here from the front page you just need to click on the 'message boards' link there or here. Message 61430 - Posted: 20 Mar 2014, 11:32:24 UTC - in response to Message 61427. State: All (17090) · In progress (304) · Validation pending (0) · Validation inconclusive (598) · Valid (16148) · Invalid (37) · Error (3). And that only counts however far back the stats go before they are purged. Message 61432 - Posted: 20 Mar 2014, 17:43:30 UTC - in response to Message 61427. Not for Milkyway. The project is creating new WUs based on the returned results, so they are trying to keep the ready to send buffer as low as possible.